Boris The Monster makes an unlikely appearance in the November 1931 issue of Photoplay, the leading movie fan magazine of its time, where picture space was usually reserved for Hollywood’s most glamorous stars. In stunning profile, likely shot by Universal still photographer Roman Freulich, Karloff’s face shines through the heavy makeup. Perhaps the photograph was taken before final touches were applied, or it was lit in such a way as to wash out the dark paint that gave The Monster its dead-man gauntness of thin black lips, sunken cheeks and dark circles under the eyes. 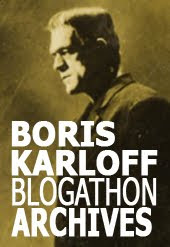 Note that we see Karloff’s forehead, perhaps treated with greasepaint or thin gauze. Note the brow ridge and the crown, built up separately. With The Monster’s next outing, for Bride of Frankenstein in 1935, makeup man Jack Pierce would use a one-piece, full forehead rubber appliance that simplified and sped up application. Note also, that Karloff doesn’t appear to be wearing the heavy eyelids that gave The Monster its menacing, lizard-like stare. 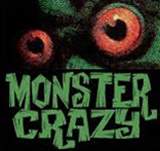 The story goes that Karloff himself suggested the droopy lids, to dull The Monster’s eyes. Here, the eyes are bright and intelligent. Photoplay was launched in 1911 as a film-related fiction magazine, soon to embrace the nascent Star System and quickly evolving into a massively influential film celebrity magazine, reigning at the peak of Hollywood’s Golden Age. With a writing staff that included the nation’s top gossip columnists, Photoplay typically featured profiles of big name performers, with heavy emphasis on their romantic liaisons, as well as movie star fashions and beauty tips. 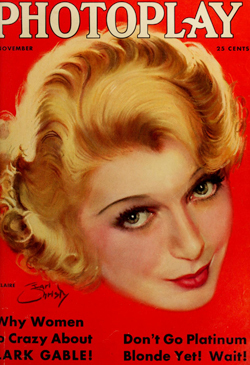 The issue at hand featured comedienne Ina Claire on the cover, painted by F. Earl Christy. A cover blurb warned, Don’t Go Platinum Blonde Yet! Wait!. Articles included The Extra-Private Life of Marlene Dietrich, Why Women Go Crazy About Clark Gable, and a profile of firebrand “Loop-de-Lupe Velez”. Though the magazine acknowledged the popularity of chillers, horror films got very little coverage in Photoplay, too grim a subject for its glamour-seeking readers. It speaks to Frankenstein’s novelty and box-office clout that the film won some degree of attention from the nation’s best-selling movie magazine. 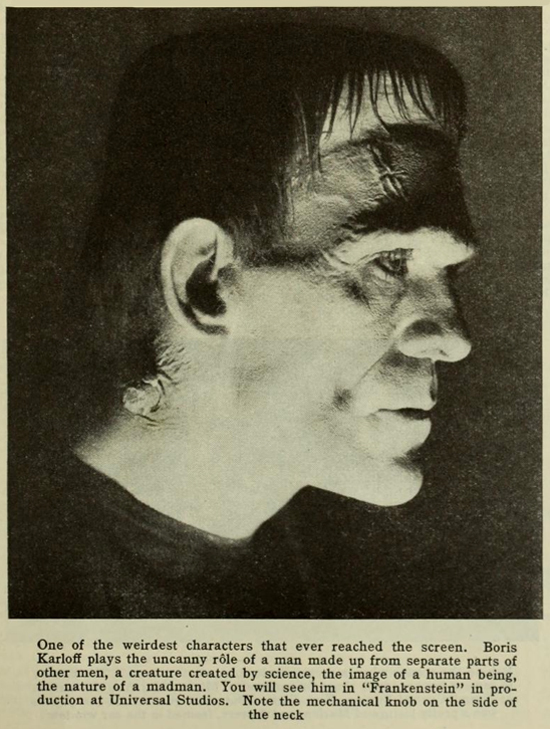 Stick around, we’ll look at more Frankenstein references from Photoplay over the next couple of posts. Interesting that the buzz on FRANK '31 was high profile (pun intended) from the get-go. Also interesting that the "secret" makeup was so boldly pictured (even if in an unfinished form) and that the "?" actor was so casually identified. And in a national publication the very month of the film's release. Guess it wasn't really that hush-hush after all. ..yes...note those mechanical knobs on his neck...veeeery interestingk.."